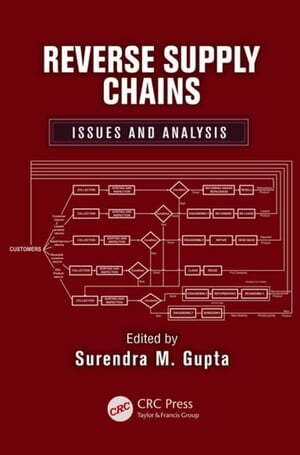 Collins Booksellers - Reverse Supply Chains: Issues and Analysis by Gupta, Surendra M., 9781439899038. Buy this book online. The introduction of reverse supply chains has created many challenges in network design, transportation, selection of used products, selection and evaluation of suppliers, performance measurement, marketing-related issues, end-of-life (EOL) alternative selection, remanufacturing, disassembly, and product acquisition management, to name a few. Under the guidance of an expert editor and with contributions from pioneers in the field, Reverse Supply Chains: Issues and Analysis addresses several important issues faced by strategic, tactical, and operation planners of reverse supply chains, using efficient models in a variety of decision-making situations providing easy-to-use mathematical and/or simulation modeling-based solution methodologies for a majority of the issues. The book introduces the basic concepts of reverse logistics and systematically analyzes the literature by classifying more than 400 published references into five major types of product returns. It then identifies the basic activities and scope of reverse logistics, examining its drivers and barriers as well as major issues and challenges. The chapters cover metrics for quantitatively comparing competing new-product designs for end-of-life disassembly on a reverse production line, how to use the theory of constraints thinking processes to determine the core problems in reverse logistics, and an integrated multi-criteria decision-making methodology using Taguchi loss functions AHP (Analytic Hierarchy Process) and fuzzy programming. They explore issues associated with remanufacturing and green and resilient supply chain management and propose system modeling based on graph theory and network flows application to analyze material resource flows in the life cycle of a product.